The cast of performers for Njal’s Saga. Photo courtesy of Myra Hope Eskridge. On October 14 of this year (AS LII), over fifty performers gathered to tell a story. Not just any story; either. It the biggest, bloodiest saga in all of Icelandic literature: The Saga of the Burning of Njal. A huge, sprawling epic tale of feuds and betrayals, unbreakable friendships and shattered families, the saga stretches over decades, includes hundreds of names and characters, and is tied so tightly to the complex Icelandic legal system that it is even used as a text in law school. The telling would take an entire day. How to bring such a story to life? Master Toki Skáldagörvir, formerly of the East Kingdom and now of Aethelmearc, had already produced a full and immersive telling of the entirety of the Anglo-Saxon poem Beowulf, first in full and then broken into two performance, enacted by dozens of individual performers. He turned to Njal’s Saga as a next and deeply ambitious step. A translation was chosen and broken into appropriately-sized sections, and then he went about recruiting performers from seven different kingdoms. Rehearsals of various sections were held over the course of almost two years, both in person and via the Internet, and there was much discussion of background reading, pronunciation of Icelandic names, and research, even to the circulation of photos of each of the very real places mentioned in the text. But the very first time that every performer was in the same place was the final day of the telling. 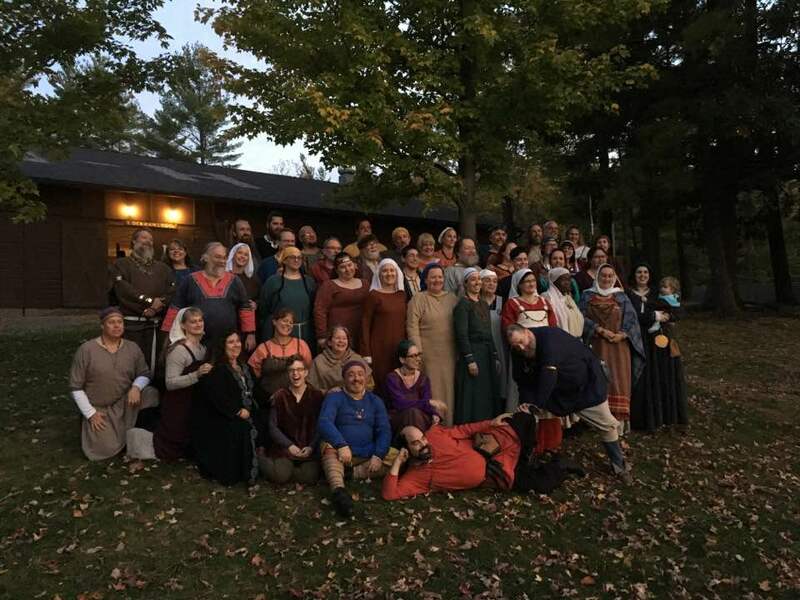 Inside a camp lodge in the Barony of Thescorre, event staff created an immersive eleventh-century hall space, right down to the crackling of logs on the fire. And at ten in the morning, the first speaker began, speaking the Icelandic words of the original. For hour upon absorbing hour, storytellers of every kind handed the tale back and forth, from outright laughter to near weeping, roaring to whispering. And for an entire day, pausing only for excellent food, Njal and all his story came vivdly to life once more. To see all the performers for the event, please check out the Performer Bios!